If you’re worried about thinning bones, or bone fractures, you probably have Big Food and Big Pharma to thank for keeping you up at night. For decades, these two industries have used scare tactics to convince the general population that they’re bones are at risk—and that they, and they alone, have the answers to your thinning bone problems. But the healthy bone “solutions” peddled by Big Food and Big Pharma have in most cases proven healthier for corporate profits, than for consumers’ bones. And some of those “solutions” have actually contributed to thinning bones. Almost 20 years ago, the dairy industry announced a fictitious “calcium crisis” caused by too many young people drinking beverages other than milk. In addition to rolling out new bottles that made milk drinking seem “fun,” the dairy industry launched its “Milk: It Does a Body Good” campaign that told teens and tweens they should drink milk now to prevent osteoporosis in later life. There were two obvious problems with the “Milk: It Does a Body Good” campaign. First, 12-year-olds don’t worry about the condition their bones will be when they are 58 years old. And second, milk is neither the best or only source of calcium. But the marketing geniuses behind the campaign didn’t let a few inconvenient facts get in the way. They forged ahead, undaunted. Meanwhile, even though milk sales were falling, cows were being “culled” to keep prices up, and the government was buying up the milk surplus no one wanted, Monsanto in the 1990s was busy at work developing recombinant bovine growth hormone (rBGH) which let dairy operations get seven to 14 additional pounds of milk daily out of a single cow. It wasn’t long before questions arose about the fate of an rBGH by-product called Insulin-like growth factor 1 or IGF-1 in the human body. As reported in the New York Times, male rats developed cysts on their thyroid glands and abnormalities on their prostates. But that didn’t stop Donna Shalala, then-secretary of the Health and Human Services Department, from refusing a request by Senators to investigate whether or not the U.S. Food & Drug Administration (FDA) had overlooked rBGH safety evidence. Shalala even went so far as to help kick off the National Dairy Council and the National Osteoporosis Foundation's national "milk mobile" which toured 100 cities, offering free bone density screenings and a chance to be in a milk mustache ad. 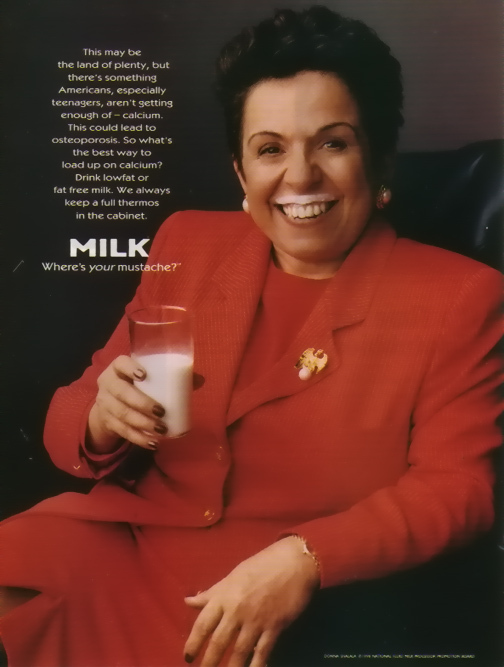 Shalala herself posed in a milk mustache ad. Big Pharma has done an even better job of instilling, in women especially, a fear of bone loss in order to sell pharmaceutical products. Soon, just as model Lauren Hutton had sold HRT, Meredith Vieira from the Today show, former Charlie’s Angel Cheryl Ladd and actress Sally Field were selling bone drugs. Soon after their approval, bisphosphonates were linked to serious side effects, including heart problems, intractable pain, jawbone death, esophageal cancer and the very fractures they were supposed to prevent. Many wondered why the drugs were approved. For example, if patients did not sit upright after taking a bisphosphonate, they could end up in the ER with esophageal damage. And the disfiguring side effect of jawbone death sometimes required a tracheostomy (an incision in the windpipe), bone grafts and even jaw removal. So much for staying young and pretty. Court documents show that Merck, who made the popular bisphosphonate Fosamax, knew about jawbone death since the 1970s but marketed the drug anyway. In fact, it was dentists, not the FDA or Big Pharma who first reported the problem. In 2013, Merck agreed to pay $27.7 million for multiple Fosamax lawsuits. How could such drugs with clear and expected dangers become bestsellers I asked Dr. Hinshaw. “The enthusiastic industrial support of the clinical trials has created a cadre of dedicated bisphosphonate supporters, convinced that the presumed benefits outweigh any possible risk,” he told me. The "industrial supporters" were no doubt also helped by a sneaky scheme concocted by Fosamax-maker Merck. It hired the consulting firm of former drug researcher Jeremy Allen to whip up fears of osteopenia—the risk of getting osteoporosis—by placing bone density–measuring machines, machines that had barely existed until then, in medical offices across the country. According to National Public Radio, Allen also created the faux “Bone Measurement Institute” to establish “osteopenia” as a health epidemic. He even pushed through the Bone Mass Measurement Act which transferred the cost of bone scans to onto Medicare. Yes, taxpayers ended up paying for scans for a largely made-up condition. All for the enrichment of Big Pharma. As many Pharma watchers know, genetically engineered biologic drugs that are liquids not pills (think Humira, Remicide and Xolair) are the new pharmaceutical profit center. So when an injectable drug to treat thinning bones, the biologic Prolia, was approved in 2010, Wall Street and Pharma had high hopes. Not only do biologics bring in as much as $20,000 per patient per year, it was hoped that Prolia would lack the serious side effects of bisphosphonates. But two years after its approval, Prolia’s maker Amgen issued a warning that included bisphosphonates' risks and more. Prolia could cause "hypocalcemia, serious infections, suppression of bone turnover, including osteonecrosis of the jaw” as well as “atypical femoral fracture” and “dermatologic adverse events," warned Amgen. Clearly Prolia was the same old wine in a different "syringe." As with bisphosphates, Prolia’s action could easily have been predicted. According to transcripts from FDA hearings, monkeys developed tooth and jaw abscesses on the drug, and human subjects developed cervical, ovarian, pancreatic, gastric and thyroid cancers. During trials, 10 people were hospitalized with the skin infection cellulitis, and one died. Breast cancer, according to the transcripts, was the "most common adverse event that led to discontinuation" in trials. Breast cancer a mere “adverse event?” Tell that to the women who endured chemotherapy—and the families of those who died. Like most of Pharma’s new biologics, Prolia compromised the immune system and invited opportunistic infections. But though FDA clinical reviewer Adrienne Rothstein, M.D. stated during hearings that Prolia "has the potential to affect multiple layers of the immune system" and that "three subjects required hospitalization for pneumonia after a single dose,” the FDA approved Prolia two months earlier than expected. Amgen deployed 1,000 reps to sell the drug which is still being marketed. Ask your doctor . . .
As anyone who follows pharmaceutical marketing knows, direct-to-consumer advertising has created blockbuster drugs through selling and redefining diseases so that more patients take more drugs for a longer time. For example, depression was once a self-limiting condition not a ailment that requires life-long drugs and add-on drugs as it is portrayed now. And Gastroesophageal Reflux Disease or GERD, while it does exist, has been whipped up by Big Pharma as a common ailment in order to sell expensive drugs called Proton Pump Inhibitors (PPIs) like Prilosec, Prevacid, Nexium and Protonix. Usually what passes for “GERD” is just heartburn that can be treated with TUMS or Maalox, or something as simple as eating less. Convincing people they have depression or GERD is not just a question of marketing expensive drugs they may not need. Both of the drugs prescribed for these conditions are highly linked to bone thinning! “Patients with gastroesophageal reflux disease (GERD) receive long-term therapy with proton pump inhibitor (PPI) agents. Several studies have recently been published suggesting that treatment with PPI may cause bone fractures,” according to a 2013 article in Rheumatology International. The FDA agreed. A review of several epidemiological studies found an “increased risk of fractures of the hip, wrist, and spine with proton pump inhibitor use,” the agency said in 2011. The aggressively marketed antidepressants called SSRIs, including Celexa, Paxil, Prozac and Zoloft, are also linked to fractures say journal articles. SSRIs “may increase the risk of bone fractures, according to new research, reported Medical News Today, citing an article in BMJ Injury Prevention. WebMD agreed. "SSRIs appear to increase fracture risk among middle aged women," it wrote, citing research in the journal Injury Prevention that appeared last year. While osteoporosis and related bone conditions certainly exist and do sometimes require treatment, fear of “thinning bones” and “osteopenia” is largely an industry concoction to sell products. Evidence strongly suggests that bisphosphonates and Prolia can make bones weaker (as can GERD and depression meds)—but so can the high-saturated fat, low-fiber Western diet that Big Food pushes. In fact, people in poorer countries where milk is not consumed often have lower fracture rates than the U.S. notes T. Colin Campbell, PhD, in The China Study, debunking the idea of "milk deficiencies." The best way to avoid thinning bones, says Consumer Reports, is to follow the advice doctors and nutritionists gave long before “milk deficiencies” were identified and bisphosphonates existed. Get busy with weight-bearing aerobic activities like walking, dancing and yoga. And eat a nutritious diet. In some cases, it may make sense to take calcium supplements, but beware—not all calcium supplements are created equal and careful attention should be paid to taking calcium and vitamin supplements in the right combination, as noted in this article on Mercola.com. More here on how calicium taken with Vitamins D and K2 provide the best balance of bone health-supporting nutrients.